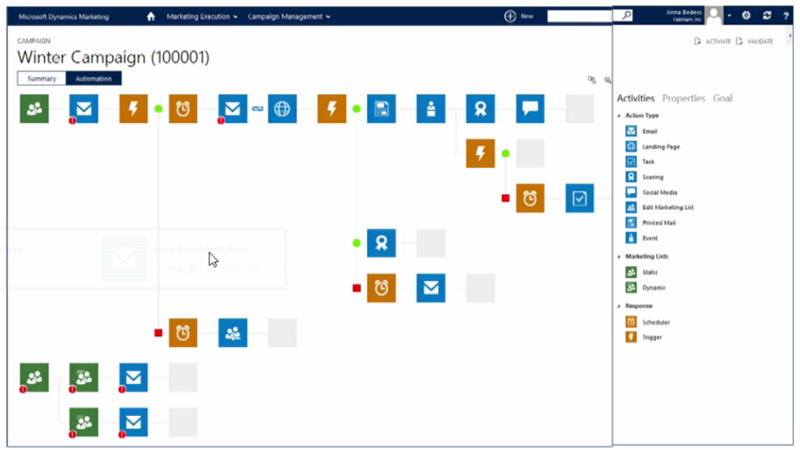 It is important to understand though that Microsoft Dynamics Marketing is still very much a separate application. It is a cloud offering that you can subscribe to by itself or as an add-on to either your monthly CRM Online subscription or your CRM On-premise license. 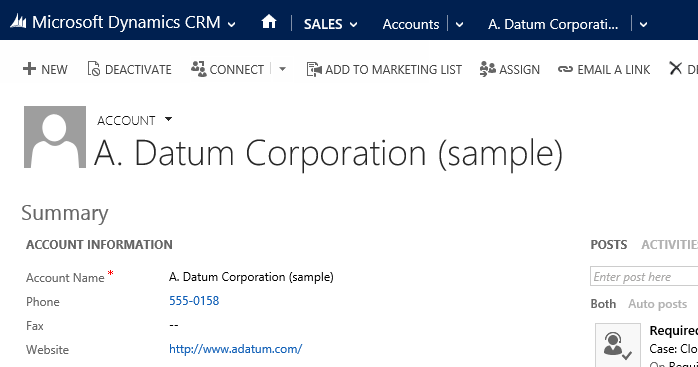 It has native integration to Dynamics CRM to synchronize common elements of their respective data models. 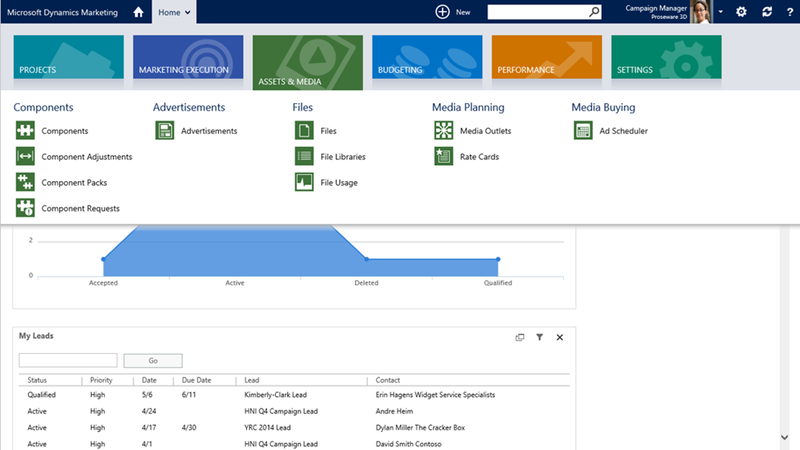 When I first heard of Microsoft Dynamics Marketing I envisioned it would offer functionality along the lines of Click Dimensions, providing mass email marketing and landing page type functionality. But there is more under the hood than that. It tackles a number of internal business processes within the Marketing Department – such as requests and approvals, planning and execution, digital asset management, event management, media buying, etc. And what I particularly like is that it makes the most of being a cloud offering and opens up the usage scenarios to include not only the internal Marketing Team but also allows ‘internal customers’ in the organization to login into a portal experience to interact with the Marketing Department and the same for external vendors/contractors/customers. 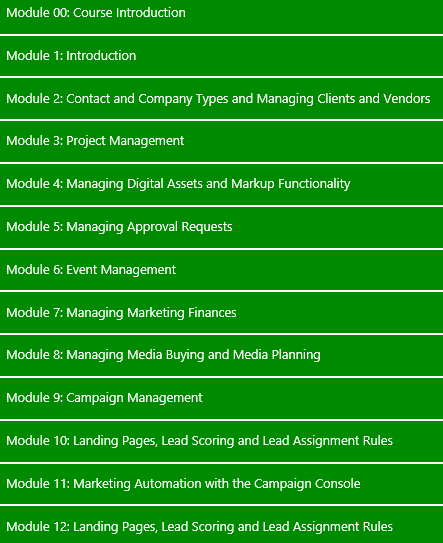 Microsoft Dynamics Marketing meets the requirements common to these two types of organizations and in addition provides the pricing and invoicing functionality that only the Marketing Agency would need. The ability to create and assign Tasks. And the ability to define Templates for standardized processes (Job Templates). 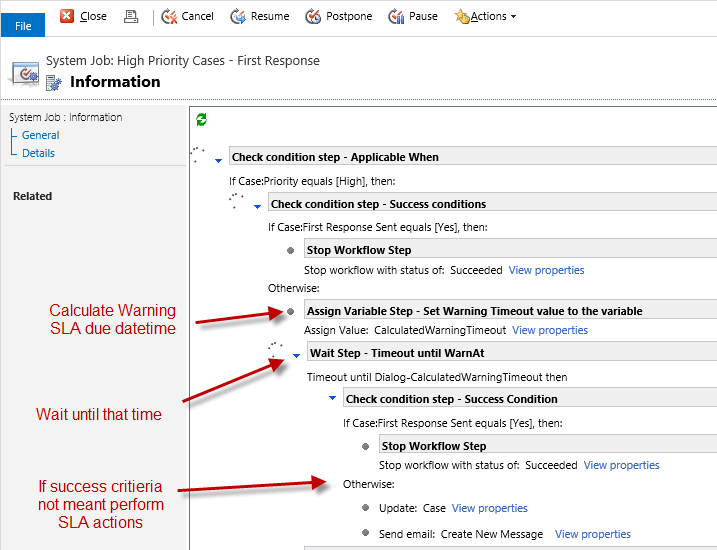 There is lots of rich functionality in here, allowing you to sequence Tasks, automatically update Job status based on Task completion and a slick UI for reallocating the pre-assigned durations on Tasks when the overall Job duration needs to be compressed. Supports both internal and external users so that design and review processes can be performed internally or externally – e.g. if you outsource collateral development your marketing vendor can submit draft’s via their external access to this tool and you can provide your marked up response. The ability to define Event Templates to standardize the definition of Events. Includes the configuration of Event Briefs and standard Tasks. The ability to define Venues and Venue Facilities. The ability to plan Events and Event Sessions. The ability to define Speaker, Food & Beverage and AV requirements. The ability to track invites, acceptance and attendance (simple tracking feature). 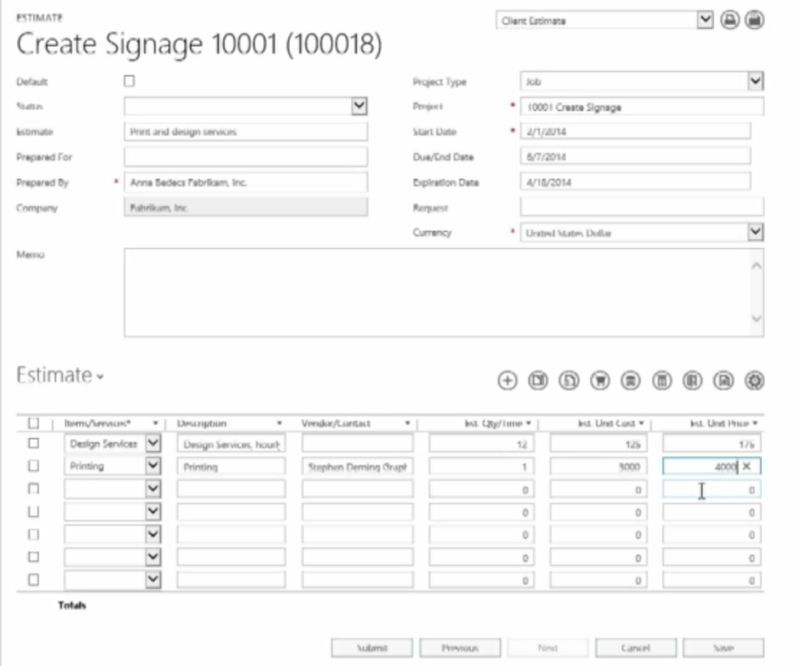 The ability to manage Registrations (more comprehensive functionality). The ability to load a Marketing List into an Event. 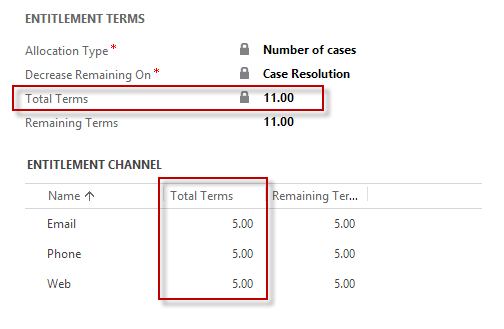 The ability to define products, expense items, services, etc. and to associate these to GL Accounts. The ability to define rate cards for items / services. The ability to execute and manage a Request for Quote (RFQ) process to seek bids from external vendors. The ability to build estimates and deliver quotes (relevant when MDM is used by a Marketing Agency that serves external customers). The ability to generate Purchase Orders and to then post expenses to the campaign based on the PO once you receive the Invoice. A Time Card feature allows internal users to code their time to various Marketing initiatives to add those labor costs to the Campaign. If the Marketing Department is serving external customers these time entries can feed the billing process. The feature can also be utilized by external contractors, providing a means for them to log their hours with you, feeding how you pay them. 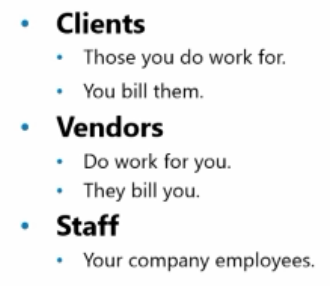 Contact & Account Management around Media Vendors. The ability to define the Media Vendors, Outlets (advertising channels), Markets and Segments (geographic/demographic groups served by each Outlet) that you interact with. The ability to maintain Rate Cards for the pricing you have negotiated with the Media Vendors you purchase from. Including the definition of Day Parts to represent advertising windows such as “Weekday Mornings”, relevant to Television and Radio advertising. 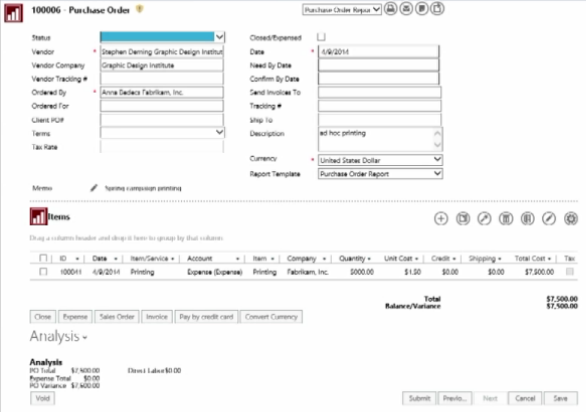 The ability to create Media Orders (think Purchase Order) and then expense those. 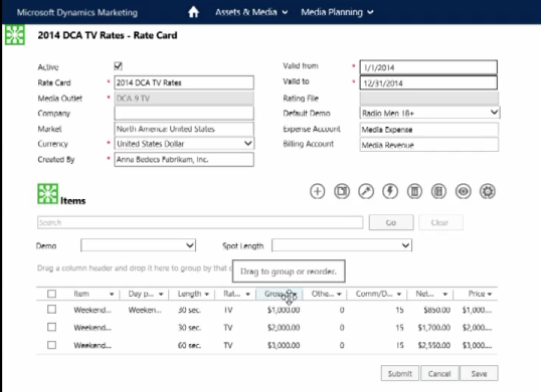 Optional ability to invoice Media Orders (if you are an Agency with external customers). The ability to define a Media Plan – i.e. the specification of individual advertising spots across channels, across a period of time, that cumulatively represents your multi-channel advertising plan for a particular campaign. This can be used to forecast the cost and to generate the purchase orders. There are useful wizards and bulk data entry tools to ensure you do not need to key each individual spot. The ability to define Marketing Contacts (specific end customers/prospects that you wish to send bulk communications to) and Marketing Lists. 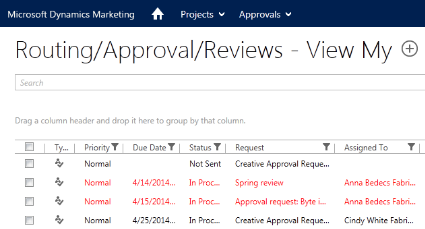 Support for Static and Dynamic Lists as well as List synchronization with Microsoft CRM. The ability to define black lists / opt out lists. 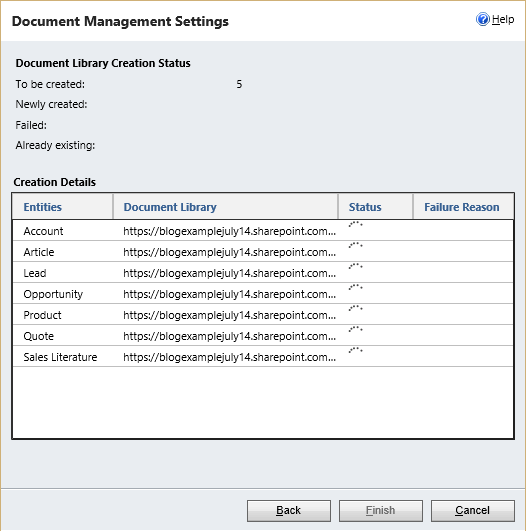 The ability to publish lists to a Subscription page for self service subscription management. And the ability to modify the appearance of this subscription page. 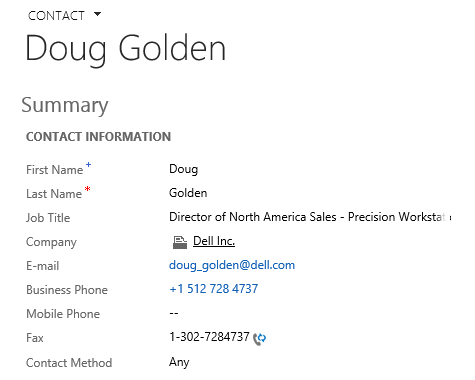 Includes the ability to enable self service update of contact details. The ability to define Email Templates including support for manual creation, creation via copy and paste of HTML, support for embedded images and for embedded contact fields. The ability to send bulk email as part of a campaign (select an email template, modify it for this particular message, select your marketing list, send). The ability to view metrics and detailed information on email blasts: opens, clicks, forwards, unsubscribes, etc. The ability to define rules to constrain the number of emails your customers will receive per week / month (either globally, or per campaign). The ability to define dynamic content in emails so that when mailing multiple lists each list receives personalized content – e.g. subject line, email body, images, links. 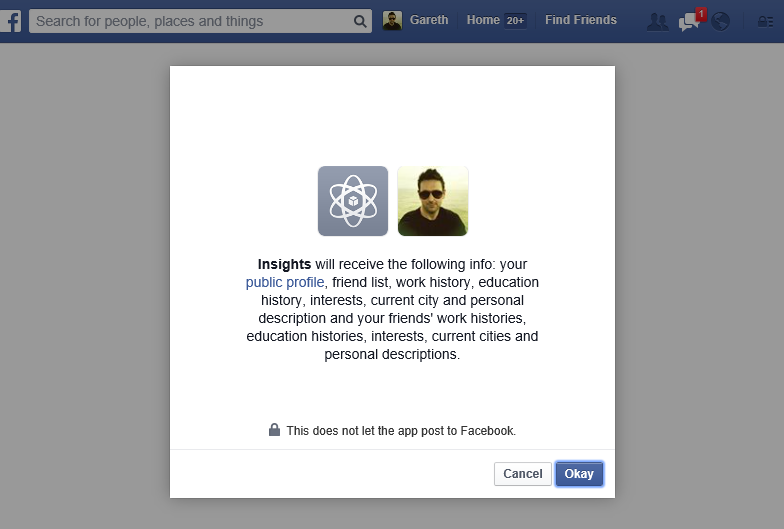 The ability to register Facebook and Twitter accounts and then post to those from within MDM. Click-through on URLs included in posts will be automatically tracked. 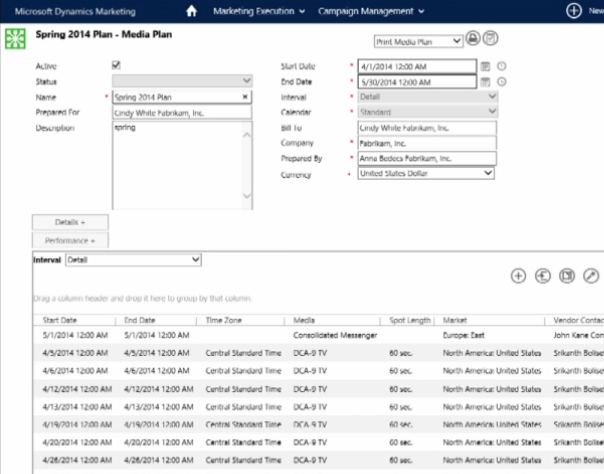 The ability to define budgets at a wide range of levels: company wide, campaign, channel, etc. Comparison views of budget to actual, with drilldown. Generation of scripts for embedding into web pages to push visitor information to MDM. Track visitors in MDM. Tracked as anonymous or, if identified, tracked against Contacts. Configurable landing pages for Lead capture. 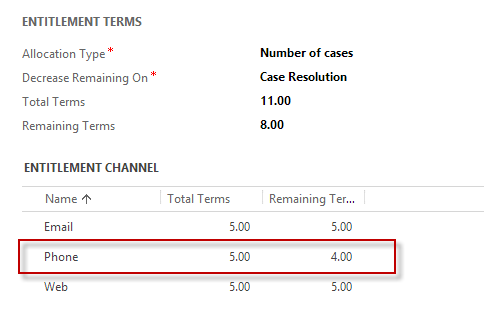 Able to select which fields are displayed / required. Able to automatically associate new Leads to a List. Built in support for CAPTCHA. Configurable rules to assign scores to leads: e.g. submitting their details on a landing page = 10 points. Add value to Lead based on fit: e.g. if they indicate they are in one of our 3 key industries add another 15 points to their lead score. If they are already a target for a particular campaign add another 20 points. Ability to have scores automatically depredate over time: e.g. decrease by 1 point every day (to represent their declining value as we fail to respond). Ability to grade Leads based on the Score assigned, to place Leads into bands and give those bands an identifier – e.g. a Lead Score between 51 and 100 places the Lead in the “Hot Leads” Grade. 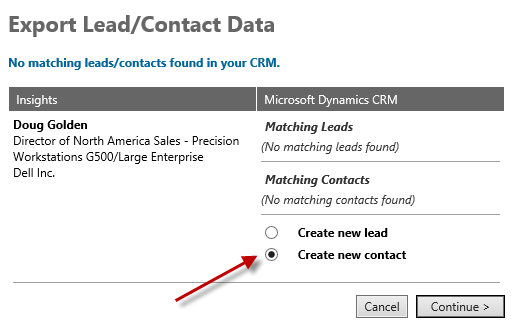 Integration between MDM and CRM that pushes Leads of a certain Grade into CRM. 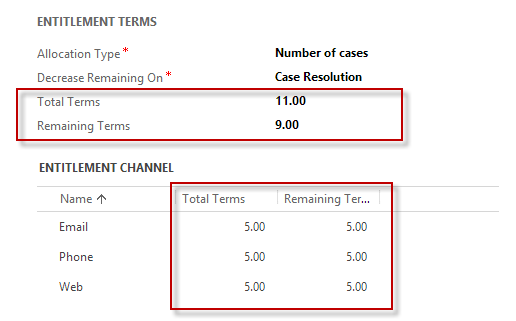 Configurable rules that will drive assignment of Leads. Multiple conditions can be defined – e.g. Industry match, Lead Score threshold, Campaign association. Rules are executed in this sequence: Lead Creation –> Lead Scoring –-> Lead Assignment. Multiple rules can be defined. They are executed in top to bottom order, allowing you to define layers of assignment, implementing conditional logic. Drag & drop designer for building out campaign automations. Includes branching logic, wait timers, triggers and copy and paste editing capability. 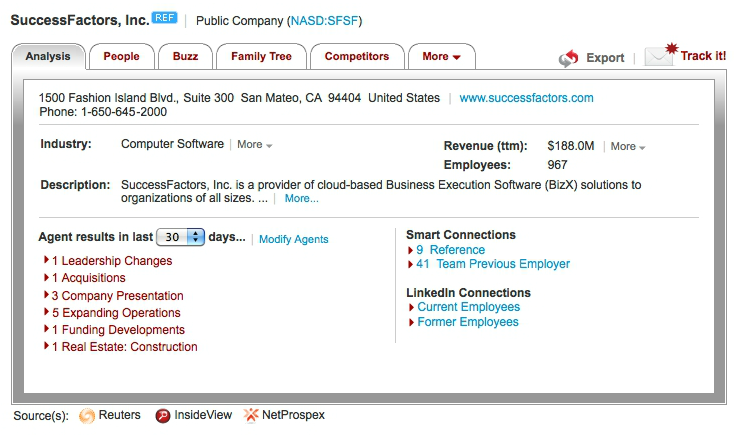 Similar to building workflows in CRM but a much simpler experience. Example: Send an email blast to a list, if a recipient opens the email wait 5 days and then send them a second email. If they arrive at a Landing Page register them for an Event. The ability to key or import results against your Campaigns – e.g. leads, orders and invoices. 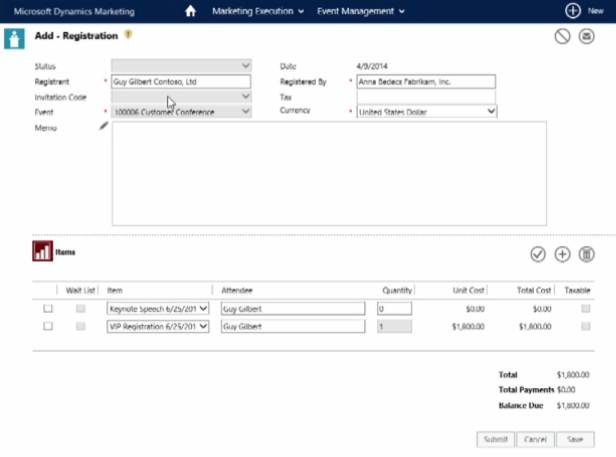 MDM calculates conversion rates based on targets and results. Includes Return on Marketing Investment (ROMI) reports. Reports available on Media usage. To do list views, in calendar format with filtering and due/overdue visual indicators. 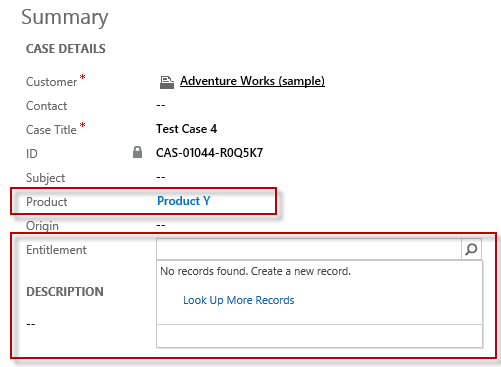 A large number of out of the box SSRS reports are included. Access is granted to users on a report by report basis. 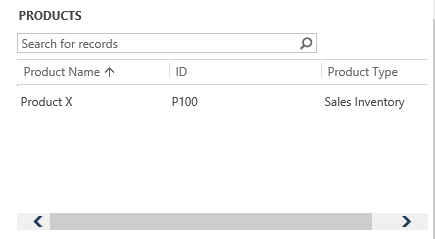 MDM has its own reporting UI, with filters and export options, which surfaces SSRS reports. 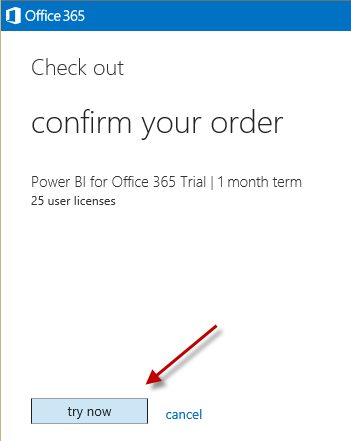 Some PowerBI charts are included and can be embedded into the Home page. 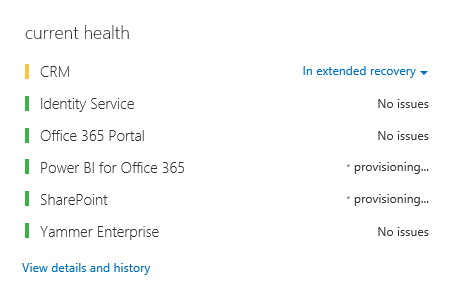 They are hosted on a SharePoint server, you are essentially iframing them into MDM. 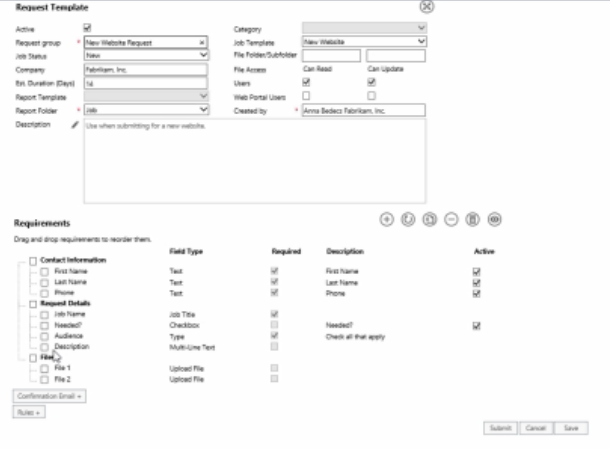 User fields are available throughout the data model that can be enabled to appear on the forms. They reside in a User fields area but you have a little bit of control over how they are presented within that are and whether they are required or not. Field labels of out of the box fields and user fields can be customized. 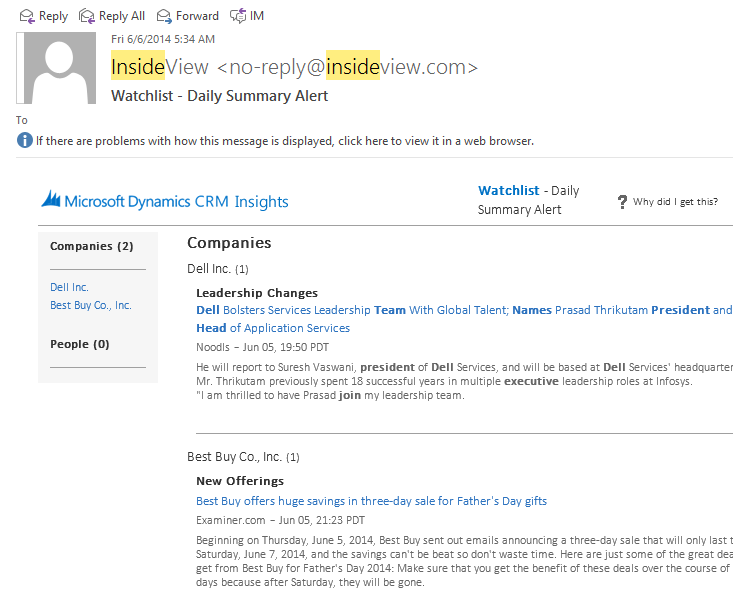 This entry was posted in Uncategorized and tagged MDM, Microsoft Dynamics Marketing on August 8, 2014 by Gareth Tucker. 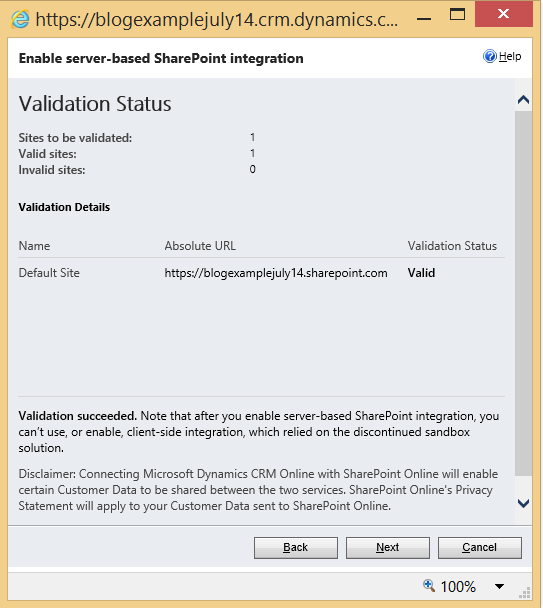 These instructions will walk you through how to enable a SharePoint Online trial to go with your CRM Online trial and how to activate the native integration between those products. First, setup a CRM Online trial, if you don’t have one already. 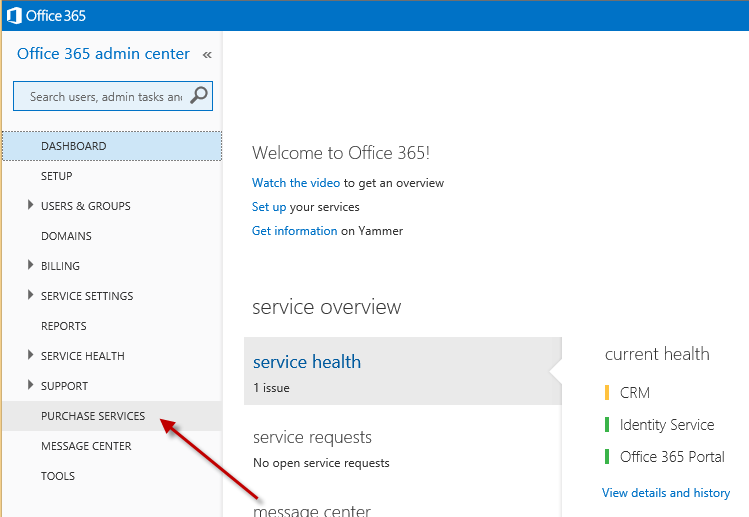 Microsoft CRM Online is part of Office 365 so a CRM Online trail actually provisions an Office 365 trial as well. 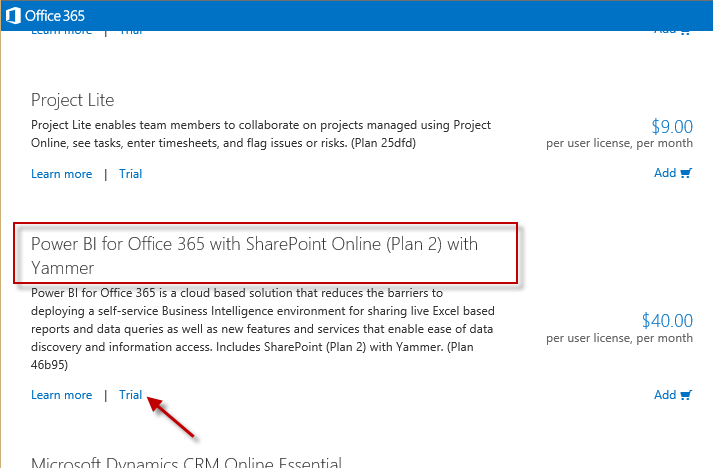 A cool byproduct of that is we can extend our trial to include the trial of other products on the Office 365 platform, including SharePoint Online. 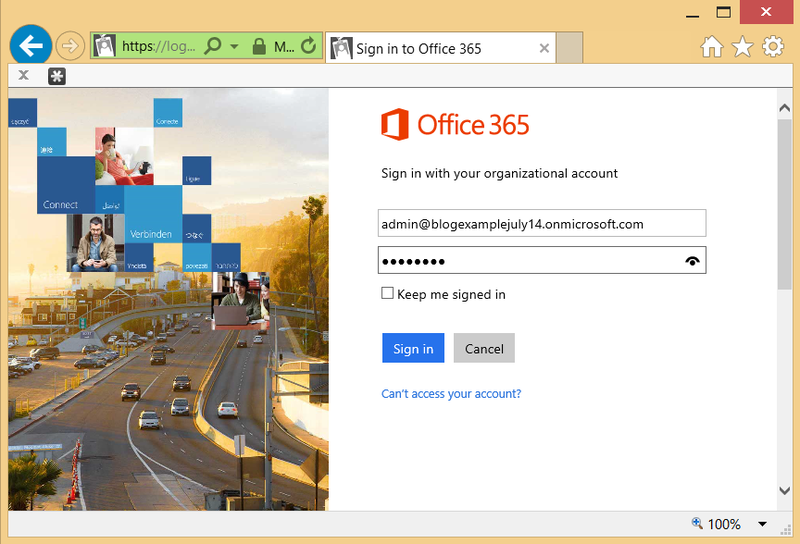 Go to your Office 365 admin page at: https://portal.office.com/default.aspx If prompted, enter the credentials you entered when you requested your CRM Online trial. CRM will launch. 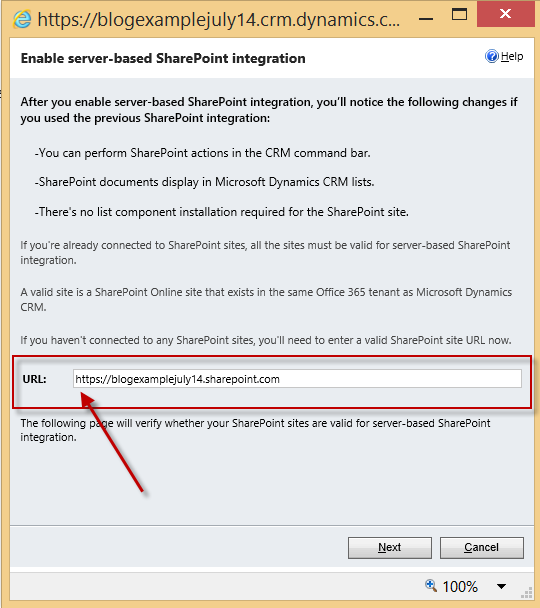 If you have not previously dismissed the “Enable Server-Based SharePoint Integration” notification in the CRM header you can click the Enable Now button to pop the configuration wizard. 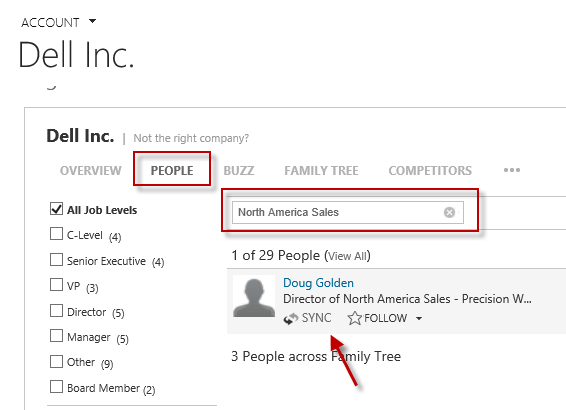 You will notice some entities are selected for you. 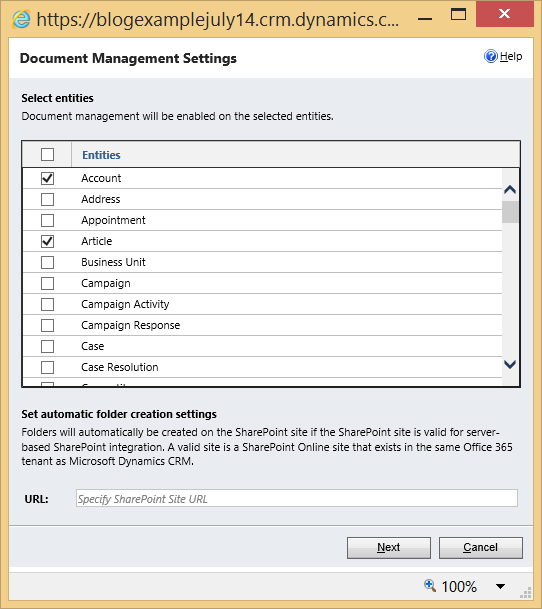 These are the entities where Document Management is enabled by default on the entity definition. You can toggle this setting from either place. 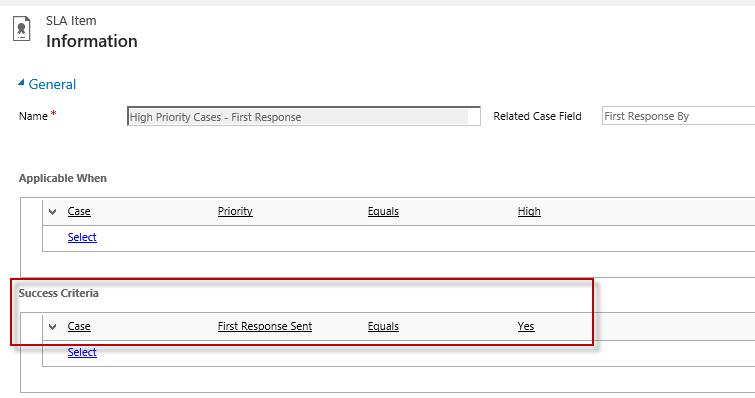 Once the Status column in that indicates success for all selected entities click Finish – and you are done. 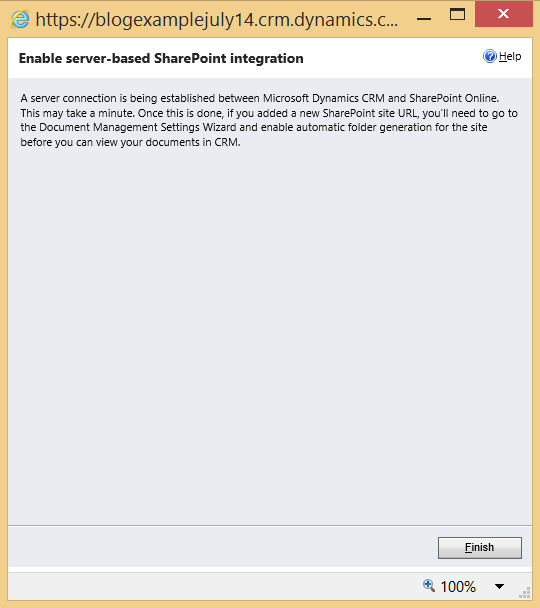 This server-based CRM-SharePoint integration is a new feature introduced in the Spring 14 release for Dynamics CRM 2013. 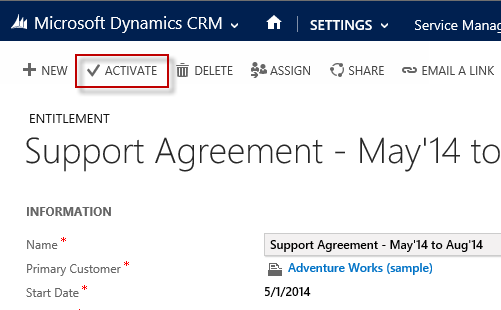 As of today (7-20-14) it only supports integration between CRM Online and SharePoint Online. If you want to use an on-premise version of either you need to go with the older integration architecture (i.e. iframe in the special list component). 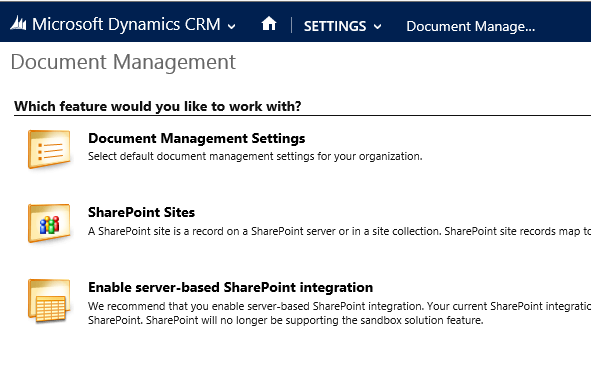 The new server-based integration represents each SharePoint document as a record in CRM, allowing the use of a normal Associated view rather than an iframe. 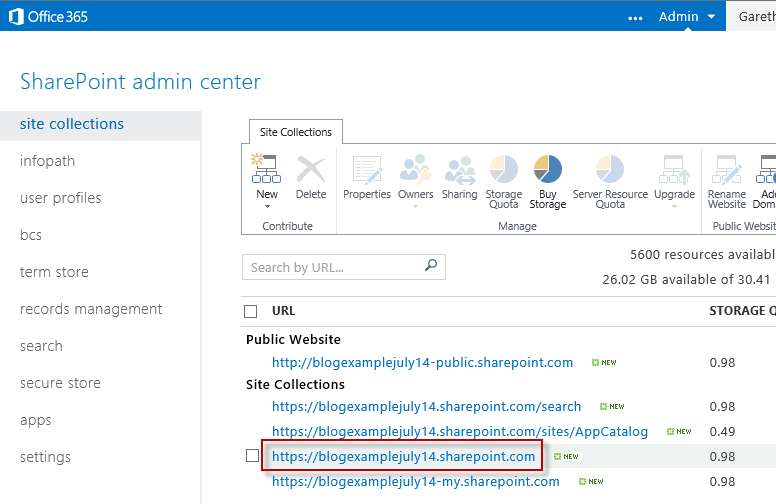 More importantly, it allows you to map metadata from the CRM entity to the SharePoint document record, improving search within SharePoint – but I won’t go into that here. This is important to understand. 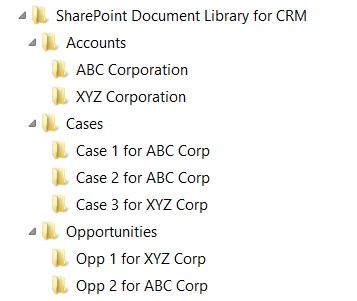 CRM is not dynamically calculating the folder name each time it goes off to SharePoint to retrieve the documents. 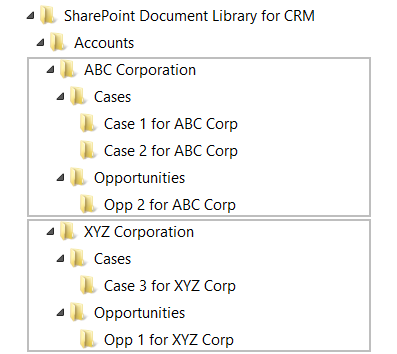 It stores the folder name in the CRM database when it originally creates it. 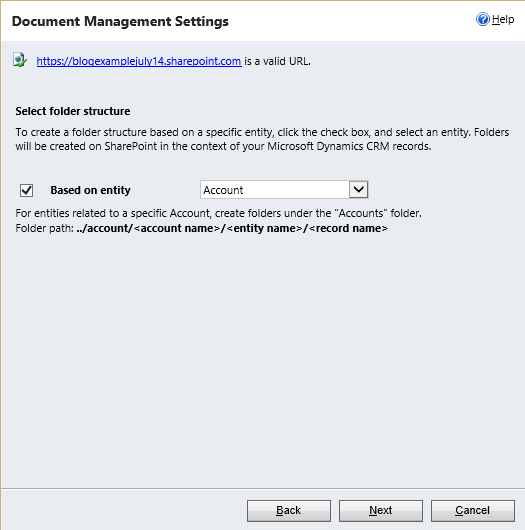 This allows for the Opportunity to get renamed in CRM without causing the CRM-SharePoint integration to break. 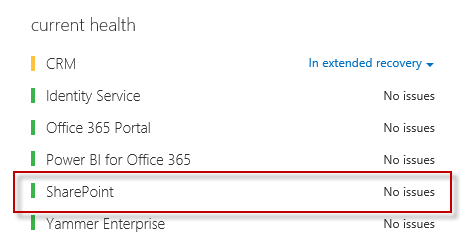 In that instance, the worst that happens is the folder name in SharePoint becomes out of date and anyone browsing directly in SharePoint will see the original name. 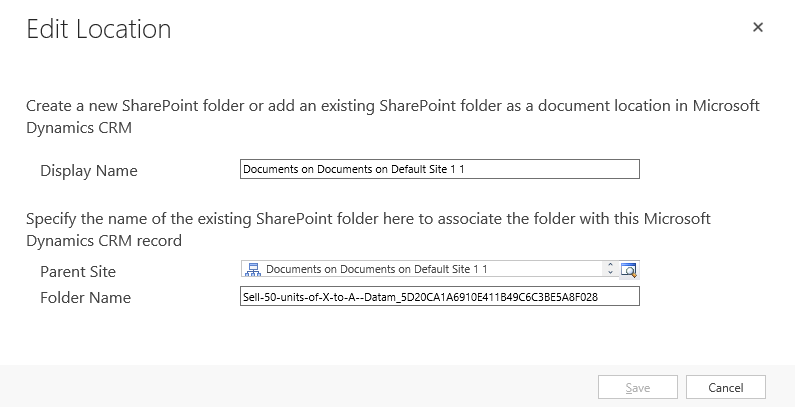 And that can be updated, you would just need to edit the folder name both in SharePoint and also in CRM via this Edit Location screen. 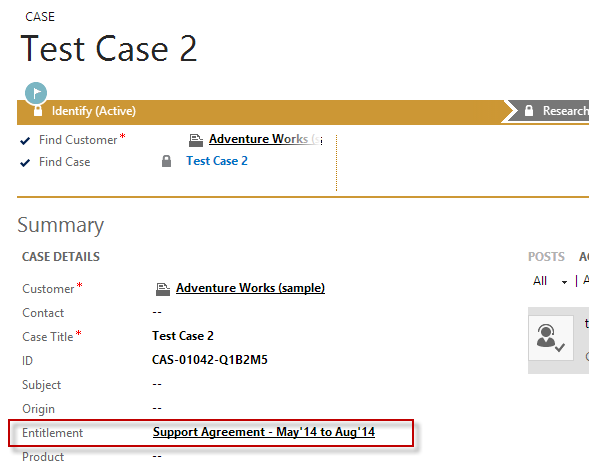 This entry was posted in Uncategorized and tagged CRM 2013, SharePoint on July 20, 2014 by Gareth Tucker. [UPDATE] – check the comments below for information on where this works and doesn’t work. It definitely works on CRM Online with Internet Explorer. Mixed reports regarding On Premise. 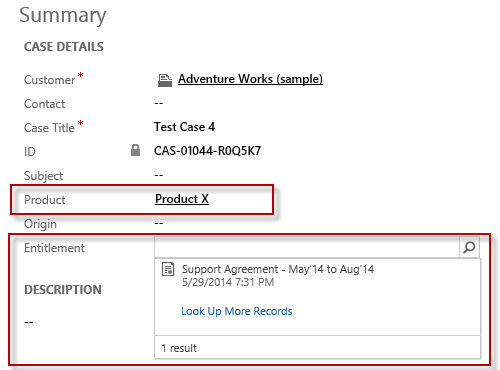 This entry was posted in Uncategorized and tagged CRM 2013, performance on July 1, 2014 by Gareth Tucker. 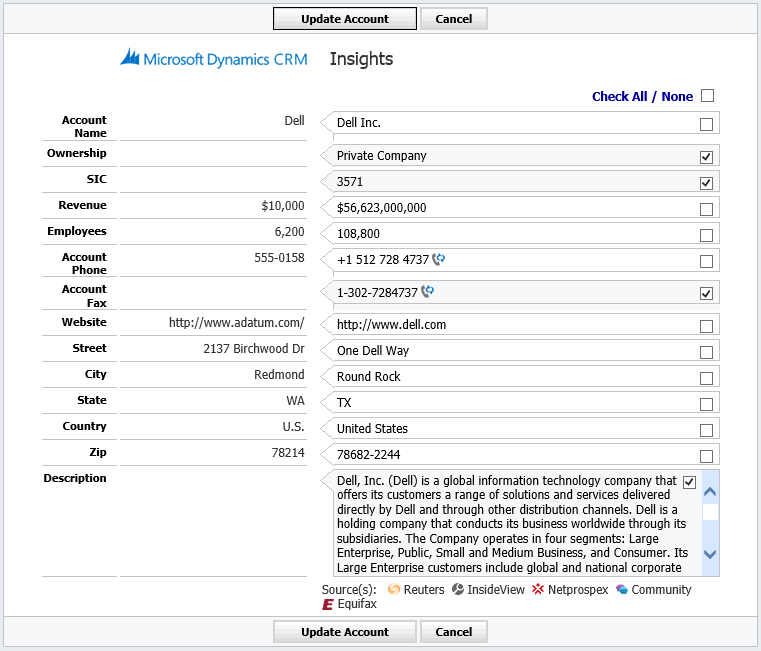 Customers licensed for the Professional edition of CRM Online now receive for free a new integration to Insights for Microsoft Dynamics CRM. 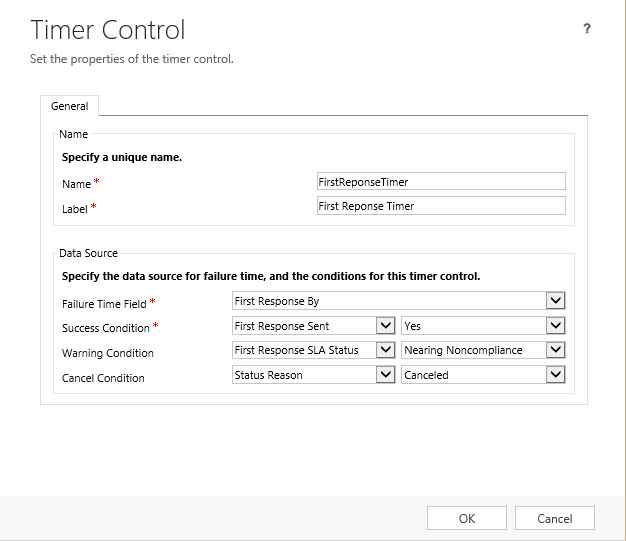 In this post I will walkthrough the functionality and explains what’s available for on-premise customers. 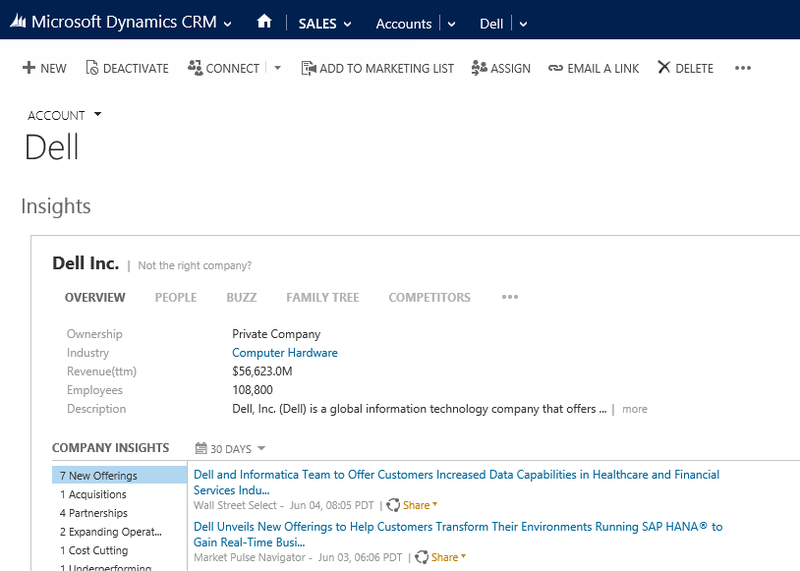 What is Insights for Microsoft Dynamics CRM? Note, this is a one-time update only. A copy and paste if you like, you are not establishing a 1-way integration. A lot of this data will be fairly static though, so I don’t think this is a limitation and you can repeat this process on demand whenever you like. The next cool thing we get with Insights is help with actually getting introduced to folks like this. 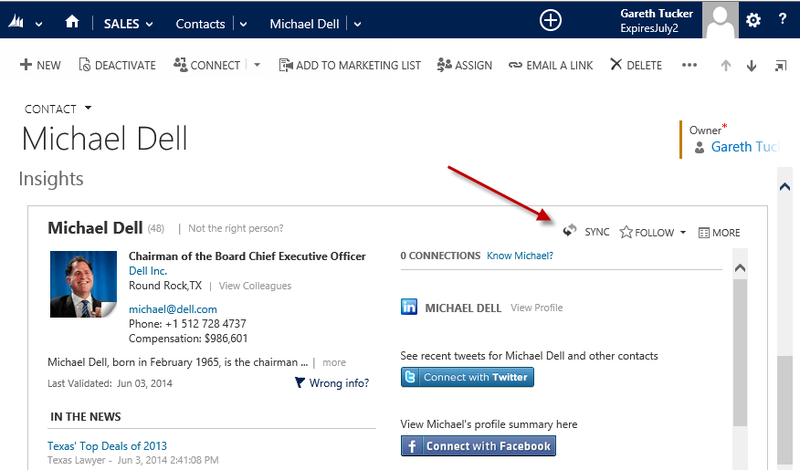 The Connections feature will aggregate all the connections you and your colleagues have stored out there in LinkedIn and in Facebook and also the Contacts residing in their Outlook and it will tell you if someone within your circle of acquaintances has a connection to your CRM Contact. The Facebook import simply required authorization. The LinkedIn import required an export/import process but InsideView have done a great job of streamlining that, it took only a a few clicks. The Outlook import is similar, requiring you do an export to CSV from Outlook manually. There is no mapping required, once the data is exported you just select the file and click Go. Something to think about here is the value of these Contacts. LinkedIn has increasingly become non-personal. I wouldn’t know 90% of my Connections in LinkedIn, However, the Contacts in my Facebook and in my Outlook I do know and yet those connections may not be common knowledge for others in my Organization and I in turn may not know which Organizations my colleagues are trying to connect with. Aggregating everyone’s circle of acquaintances and then sharing this out within the Organization to identify connections and enable introductions is a very powerful tool. 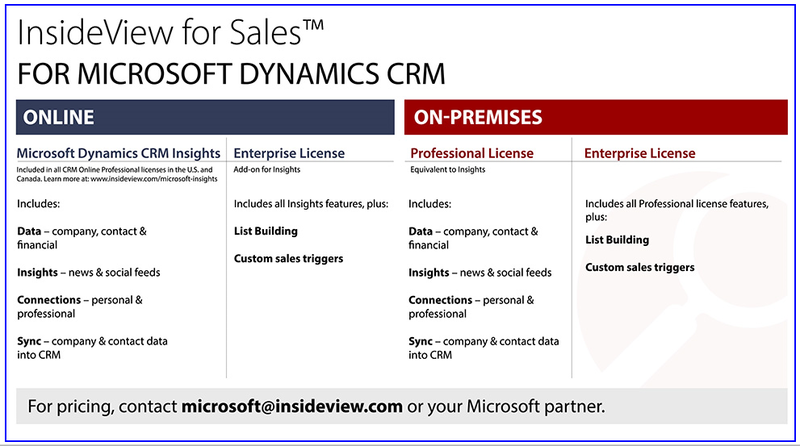 If the CRM Online Professional license isn’t for you then InsideView have their classic offering for Dynamics CRM. To get your hands dirty with Insights simply spin up a CRM Online Trial and then follow InsideView’s instructions to enable Insights. To try it out on an on-premise installation you can request a 30-day trial here. 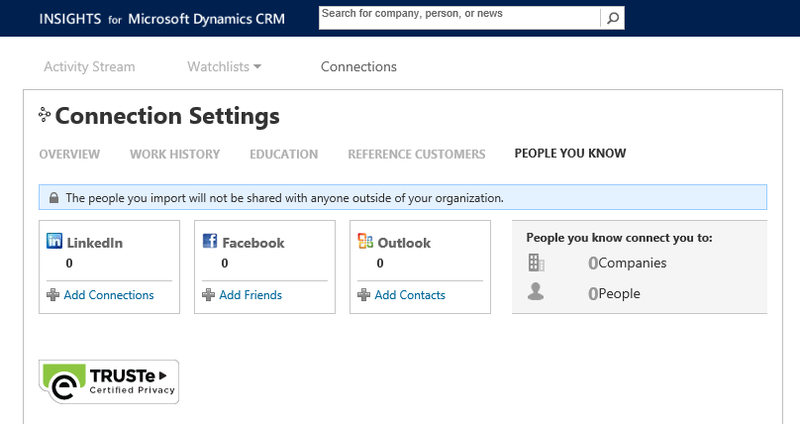 You CRM Org does not need to be IFD enabled, except to enable the SYNC feature (as that feature has Inside View writing into your CRM). 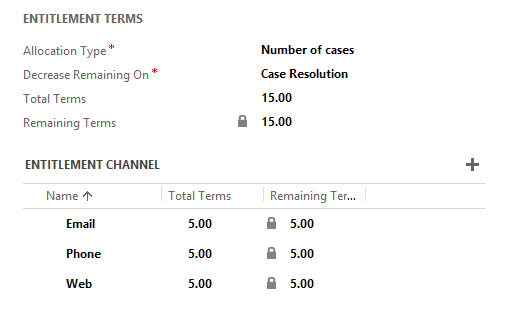 I think its awesome that Microsoft have bundled this into CRM Online. And in many cases this must be a no brainer for On-premise customers too. 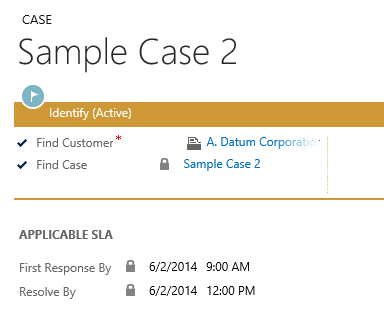 This entry was posted in Uncategorized and tagged CRM 2013, Inside View, Insights on June 4, 2014 by Gareth Tucker.